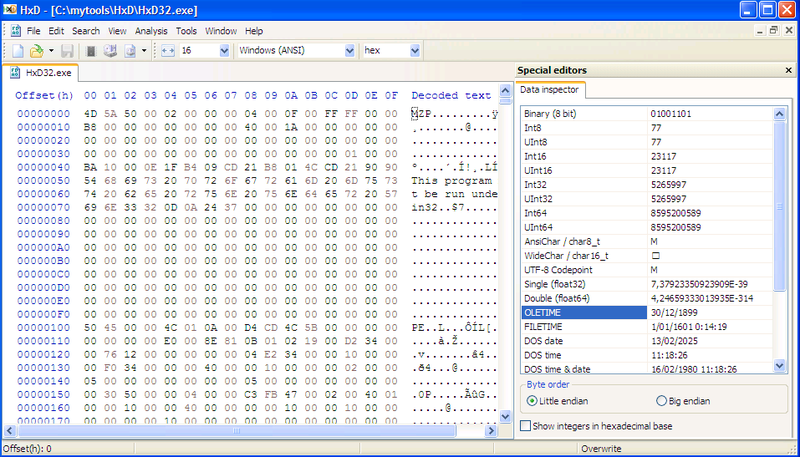 HxD is a carefully designed and fast hex editor including raw disk editing, modifying foreign RAM and handling files of any size. The program includes search/replace (ASCII | Unicode), export, checksum/digests, insertion of byte patterns, file shredder, concatenation or splitting of files, statistics and more. 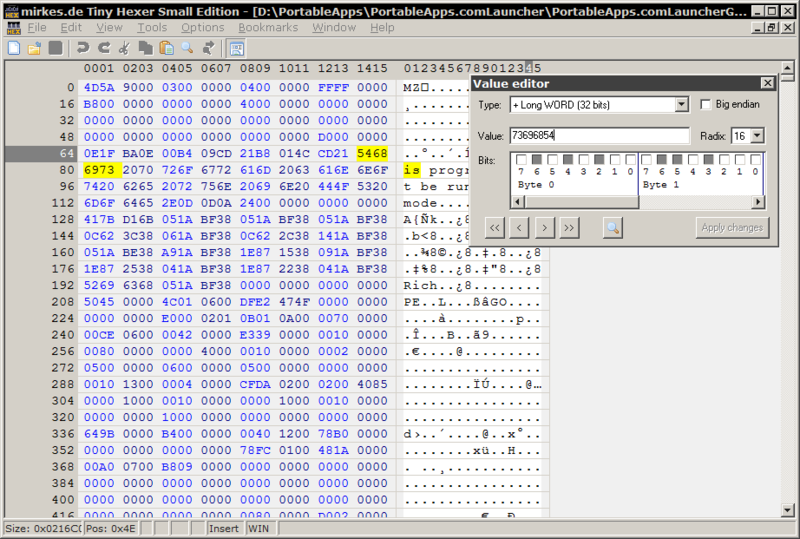 v2.0.0.0 is now out in stable, after almost 10 long years, and it's still the best Hex editor! HxD was remarkably useful yet in its former v1.1.7 incarnation. The solution to [Scrolling on Windows 10 tablet problem] is appreciated. 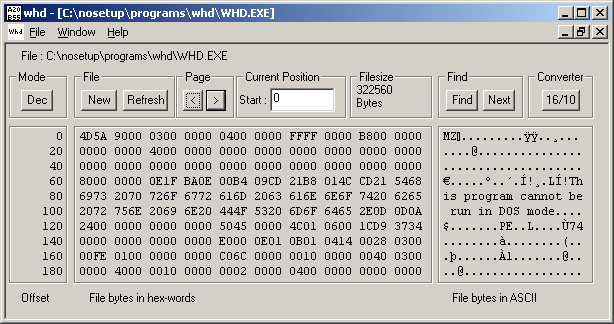 Hex-Ed is a quite small and efficient Hex Editor for programmers. How to extract: Download the ZIP package and extract to a folder of your choice. Launch HN_Hex-Ed.exe. The download link has been updated to the new site where Hex-Ed can be downloaded without problems. 81KB. I don't know why I love these small proggies so much. Anyhow, this editor works great. It is not polished, but it certainly works. Good call, AlephX. 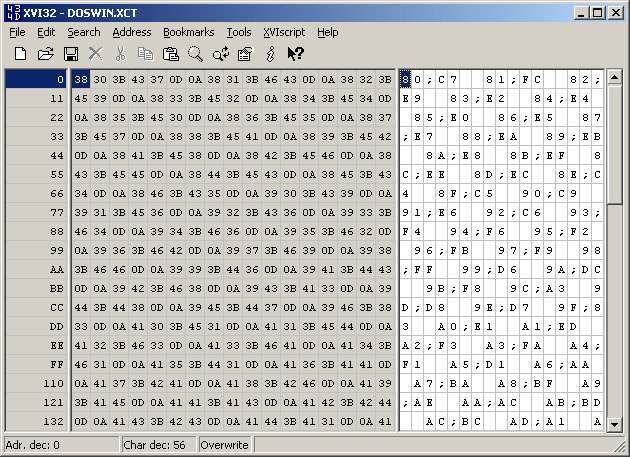 Tiny Hexer Small Edition is a minimal hex editor for binary files with an intuitive interface. The program features multiple file edition, the ability to edit sectors of the disk or other media including flash memory on drivers drive or digital camera. The program can change the virtual memory of other processes and open files up to 2 GB. The "Small Edition" was originally developed for BartPE as a version that requires fewer system libraries and can operate on minimal dependencies. 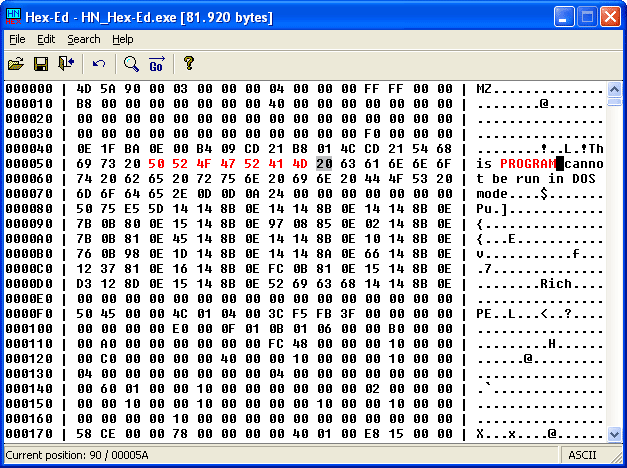 XVI32 is a hex editor with large file capability, built-in scripting, data inspector, fast search-and-replace function and many other features specific to manipulating files in hex mode. How to extract: Download the ZIP package and extract to a folder of your choice. Launch XVI32.exe. When pasting hex strings from the clipboard, separation of hex chars with spaces is no longer mandatory, e.g. both 0D 0A as well as 0D0A is now valid. This refers to dialogs (search, replace and so on) and the menu item Edit | Clipboard | Paste from hex string. Note: the formats can't be mixed (e.g. 0D 0A00FF is not allowed, the format must be either 0D 0A 00 FF, either 0D0A00FF). Shortcuts for menu items File | Close (Ctrl+F4), File | Save As (F12), Address | Remember Address (Ctrl+Alt+R), Address | Goto Remembered (Ctrl+Alt+G), Tools | Options (Ctrl+Alt+O). Bugfix: Backspace now works within an hex input field when the whole hex string is selected. Bugfix: Invoking CHM help file now works when starting XVI32 outside its own directory. Holy Cow!! I thought this was totally not developed anymore since it was last updated in 2003!! It's great to see some sort of update especially since I have been using it since 2004. Yes. This program was perfect hex editor to me for years. New version is a great news. WHD allows you to view and edit the contents of any file in hex or decimal. Website offline; linking to Softpedia. How to extract: Download the ZIP package and extract to a folder of your choice. Launch WHD.EXE.